Two infants were among the casualties. 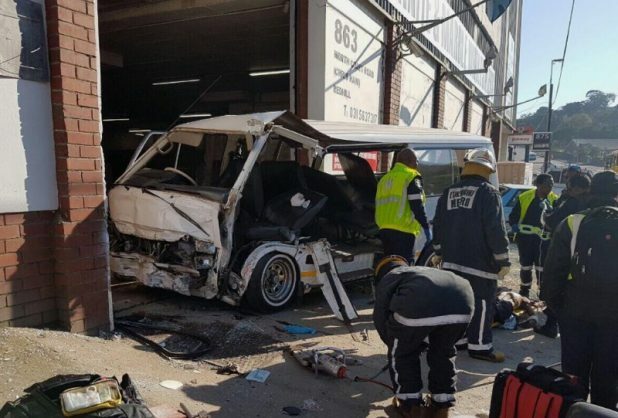 At least 18 people, including two infants, were injured when a minibus taxi collided with a car and then smashed into a wall in Briardene in Durban on Saturday morning, paramedics said. Crisis Medical paramedics arrived on the scene on Chris Hani (North Coast) Road near the Blackburn Road intersection to find a minibus taxi had collided with a car before smashing into a building, Crisis Medical said in a statement. A call was made for additional emergency services and resources while paramedics worked on the scene to triage the injured. A man, believed to be about 80 years old, was found to have suffered serious injuries and was trapped in the wreckage. Advanced life support intervention was needed to stabilise the man while eTthekwini fire and rescue services worked hard to free the man using specialised hydraulic equipment, including the jaws-of-life. Once free, the man was placed onto a mechanical ventilator to help him breath and taken by ambulance to a nearby hospital for the immediate care he required. Seventeen other commuters sustained injuries ranging from minor to moderate, with two children aged between two and three, having suffered minor injuries. The injured were treated on the scene before being taken by ambulance to various nearby medical facilities for further care. The cause of the collision was unknown.